So, you’ve been reading our past blog posts about what a Bookkeeper does and when the right time to hire one is and you’ve made the decision to go ahead and hand over the bookkeeping – GREAT! Good for you! I don’t think you’ll regret it for one second. Now, what do you need look for when hiring a bookkeeper? I’ve got some tips for you! I’ll be talking about outsourcing to a business like Steadfast or even a freelancer. If you’re reading this, then you’re most likely a Creative Entrepreneur with a small business that doesn’t really require an in-house employee. Most small businesses benefit best from an outsourced bookkeeper due to costs, industry specialization and flexibility in schedules. 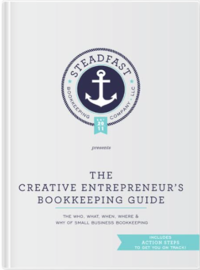 How long have you been doing bookkeeping and how did you get started? What exactly can you handle for me? What will I still be responsible for? What is your specialty? Do you work with a lot of (fill in industry here)? Do you work virtually or in my office? If virtually, how do you get all the information you need? What bookkeeping software do you prefer to use? If I’m just getting started with my bookkeeping and don’t have any systems in place, how will you go about getting those systems setup for me? How comfortable you feel about your business finances. Is it overwhelming to deal with or do you love crunching the numbers. Are you a detail oriented person or do you just want to know the bottom line each month? Asking and answering these questions will give you both a pretty good idea of what you offer/need. This initial conversation is a great time to feel out their personality and make sure it’s a good fit for you. If they are talking in terms that you don’t understand and they’re not willing to explain, than it’s probably not a good fit for you. We offer free consultations and would love to talk to you – schedule your consultation here. Ultimately, you want someone who has experience working in your industry, utilizes the latest technology and has systems in place to be able to offer the most efficient service. Be open and honest with them from the start as this will be a long-lasting partnership and it’s best if it starts out on the right foot. Remember, don’t feel embarrassed or ashamed at your current situation. We’ve seen/heard it all and are here to help, not judge.